Cambridge, April 3rd, 2019. 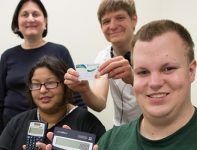 Young adults with diverse learning differences will learn about a program geared their specific needs for dorm living, student activities, and a curriculum focused on career training and independent living. Hear how students get support from faculty and staff during the two-year core program and after graduation through two programs that guide transition into the working world. Lean about their extensive network of internship providers and employers to assist students pursue their career goals.